This November legendary Hellboy creator Mike Mignola, NEW YORK TIMES bestselling novelist Christopher Golden and Dark Horse Comics will unleash the first ever comic book appearance of their character Joe Golem from their novel Joe Golem and the Drowning City. A five issue Joe Golem: Occult Detective mini-series will be co-written by frequent collaborators Mignola and Golden, with art by Patric Reynolds (Serenity), colors by award winning colorist Dave Stewart and covers by Spectrum Award-winning painter Dave Palumbo. The new series takes place prior to the events of the illustrated novel Joe Golem and the Drowning City. Set forty years after an earthquake leaves Lower Manhattan partly submerged under 30 feet of water, Joe Golem must hunt a horrifying creature that is pulling children into the depths of the city’s canals. 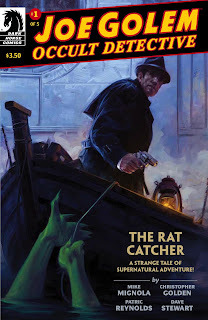 Like their collaboration on the Baltimore graphic novels, the events of Joe Golem take place outside of the “Mignolaverse”, the strange, shared universe inhabited by Hellboy, BPRD, Abe Sapien, and Frankenstein Underground. The horror of Joe Golem is distinctly urban; the series offers a haunting dystopian mid-twentieth century New York. "Joe Golem is full of pulpy goodness, weird alternate history, monsters, and magic and it's full of insanity you're not going to find anywhere else." said Golden. “We're telling the story of Joe Golem: Occult Detective, solving mysteries in the flooded streets of mid-20th century lower Manhattan with the ancient Simon Church, who's keeping himself alive with magic and machinery at the same time he's keeping Joe in the dark about his own origins. We want to immerse you in Joe's world, what life is like in the Drowning City, and with issue one, we dive right in." Mignola and Golden are currently writing BALTIMORE: THE CULT OF THE RED KING, with art by award winning children’s book illustrator Peter Bergting, colors by the award winning Dave Stewart and stunning covers by Ben Stenbeck (FRANKENSTEIN UNDERGROUND). Golden’s most recent novel, TIN MEN, was published by Ballantine Books earlier this month.